East Saanich neighborhoods display a unique natural beauty, abundant nature trails, hiking trails and cycling paths, and welcome families who are seeking specific types of housing, from cottages to more traditional homes, from sleek and efficient condominiums to family-friendly large yards and secluded sites. Schools, parks, sporting facilities, golf courses, shopping, restaurants and commercial areas are all available within the confines of the East Saanich neighborhoods. 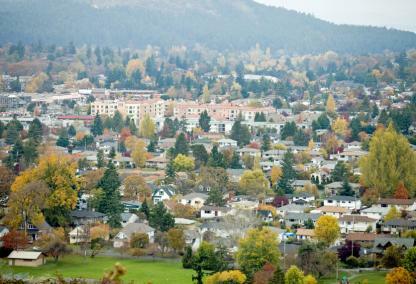 The University of Victoria East Saanich campus is a magnet for students from the whole of Canada, with an enrollment of 20,000. UVic was established in 1963 as a research-intensive institution, a successor to Victoria College. The student population in the area contributes to the life and vitality of the region, and also to its popularity as a place to live. While it may not be as exciting in this area as it would be in a strictly urban neighborhood, nor as sedate and quiet as in more rural surroundings, the benefits of the mixture to be found here, factoring in ease of reaching other areas and proximity to superb recreational venues, certainly tip the scales favorably. The variety of options in East Saanich, in style, price and surroundings, make it a particularly popular area for those seeking a place to call home.